Markings: Marked at bottom edge, unidentified collector's mark "TC". Two contemporary Bolognese draftsmen worked at different times on this unique drawing. Sculptor Alessandro Algardi added the figures after painter Francesco Grimaldi had created the landscape. By inserting the Holy Family, which fits so naturally into the composition, the elder Algardi may have meant to improve his junior colleague's composition. The figural group balances the central tree and gives the landscape a recognizable subject matter. To achieve greater luster, Algardi also may have added the brown wash throughout. The artists' styles are distinctive. Algardi drew his playful family grouping with a more delicate, graceful, even fragile line than Grimaldi's bold squiggles and hatching, which are especially evident in the dynamic, dominant tree. These two artists often worked together on architectural commissions, yet only one other similar sheet exists, an architectural drawing in which Algardi corrected and added to Grimaldi's work. 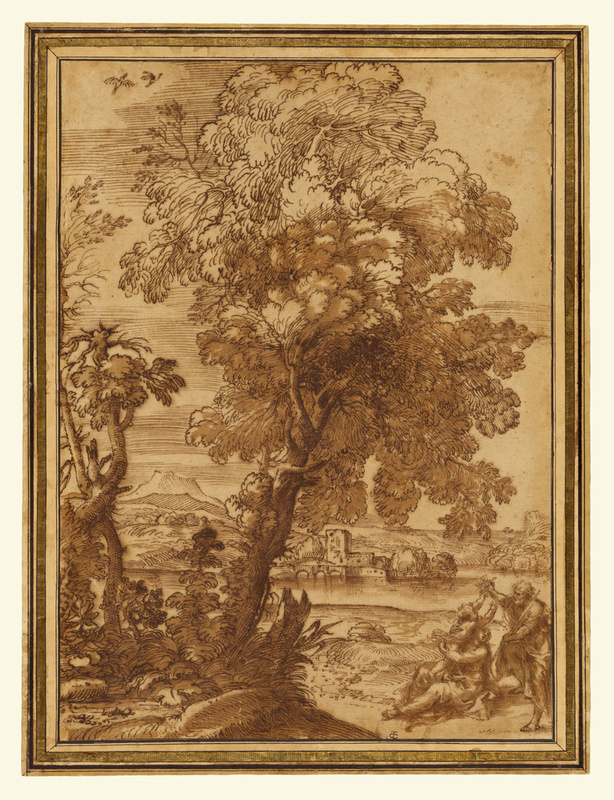 This drawing could have been made in preparation for Grimaldi's etching of the same subject.